I’ll be honest, before I started blogging I was never really into YouTube. I was always behind with the latest viral videos, I wasn’t subscribed to any vloggers and I’m not sure I even knew who Zoella was. I watch a whole range of videos, from makeup tutorials, to fashion look books, to travel videos, but some of my favourite videos are daily and weekly vlogs. 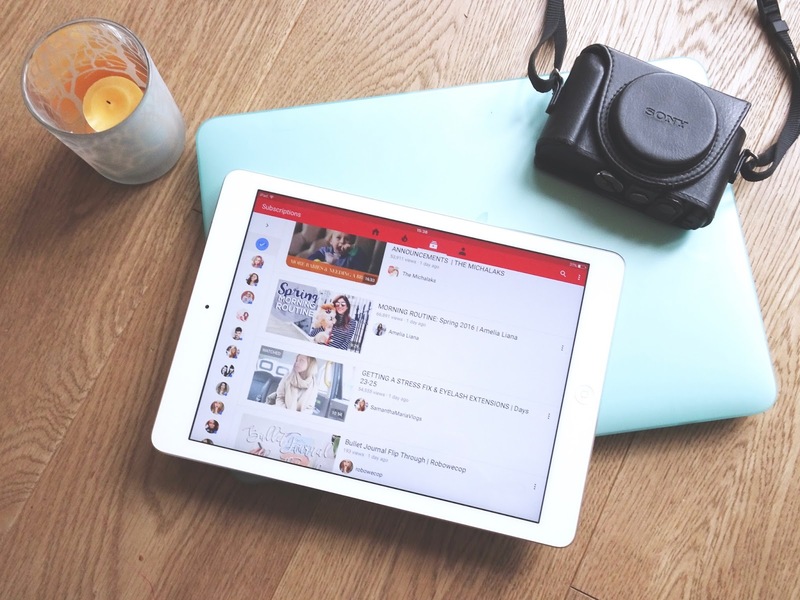 Since I loved sharing the blogs that inspired me in 2015 and 5 of my favourite Instagram accounts, I thought I would talk about some of the vloggers whose weekly & daily vlogs I never fail to watch when they appear in my subscription box. Without a doubt, the Michalaks win the title for the most beautifully and artistically crafted vlogs I have seen, and they give me unrealistic blog, and life, goals on a weekly basis. The range of shots, equipment and amount of thought that goes into each second of video is amazing, and the accompanying soundtrack is music I will actively go and listen to. But what makes their weekly vlogs even more enjoyable is that they’re so down-to-earth and real. They don’t try to glamorise their life any more than necessary, and they are always truthful about the realities of working from home and having a two-year-old. Brogan was one of the first weekly vloggers I started watching, and I don’t think I’ve missed one since. The success of her channel and weekly vlogs are undoubtedly down to her friendly and approachable personality, and her evident love for creating videos and gratitude for her ever-growing loyal following. Brogan strives to be as honest and open as she can with her subscribers, which another of the reasons I continue to watch her videos week in and out. Emily is principally watched for her beauty videos on her main channel, and she also has a second channel where she posts (mostly) daily vlogs. There are very few YouTubers who I will give a bit of my time every single day, but Emily’s vlogs are those that I will attempt to never miss. She is an infectiously fun and positive person, but is also very mature and level-headed for her age and level of success. One of the things I enjoy most about Emily’s vlogs is that she is very self-reflective and is always trying to improve on her videos and herself as a person. I first discovered Jess through her fashion blog Copper Garden, and consequently found her main YouTube channel and then vlog channel. As well as giving you a chance to learn more about the person behind her blog, Jess’s weekly vlogs also demonstrate how she successfully manages her time between uni work, keeping fit and running a really successful blog - something that amazes me every week! I’ve been watching Alice’s videos for about six months now, and both her main channel and vlog channel have deservedly grown so much in that time. She’s changed between weekly and daily vlogging, but I’ve found that I’ll happily watch along whichever the format. Alice dedicates so much of her time to making YouTube videos, and she seems like such a genuine and lovely girl. I would love to know if you watch any daily or weekly vlogs – let me know your favourite channels in the comments!